Week 7 | Finished or frogged? I was hoping to feature a finished wrap before this post. 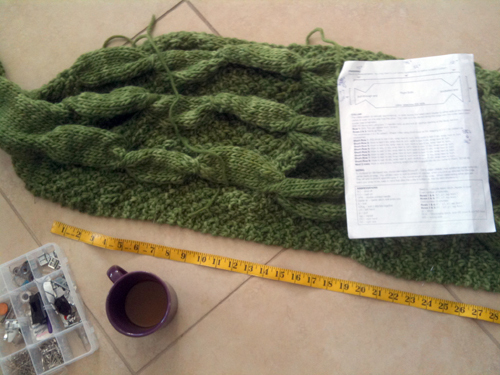 Alas, I think my next session of knitting time will be spent frogging. I knew the wrap was coming out too long as I was knitting, but as a novice knitter I didn’t want to take it upon myself to redesign mid-pattern. I finished the wrap, late last week, leaving only the collar when I realized, with no uncertainty, that it was just too long. I contacted the designer to just check in on my situation, in case it was supposed to be long and then somehow magically becomes shorter when the collar was added, but sadly, my wrap is just too long. FYI, I am Captain of team ‘follow the pattern and keep knitting’. Chris, our resident knitter (and Captain of team ‘frog it’), pointed out the simple fact that if it doesn’t fit right, I wouldn’t wear it. She also said that there was no way the collar, no matter how tight, would bring in the wrap as short as I need it. ‘Sorry Jacqueline, wishful thinking’ was how she put it. Actually, she’s a colourful talker but we can’t use those words here. After measuring, stretching, thinking, pinning, measuring again and having some coffee before work Tuesday morning, I decided that giving the collar a fair shot to do its thing was the right thing to do (Go team, ‘keep knitting’). I figured that three rows in and 45 minutes later I would know if it was in fact lifting up the collar enough to continue on. 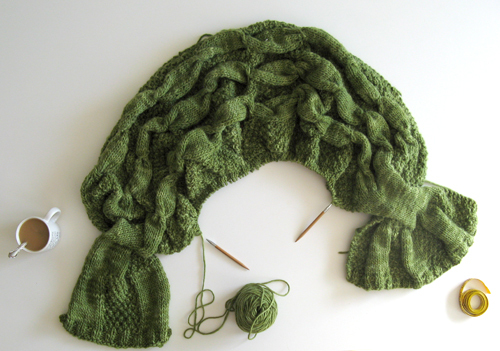 Last night, sitting in the car off Dundas street, before a 7pm meeting, I added the collar and knit three rows. Sadly, while the collar did life the wrap and bring in the top side, it was not enough to avoid the dreaded frogging festivities that will occur at lunch today (2 points to team ‘frog it’). Let the record show that I did complete the wrap and begin the collar, just in case I don’t finish it a second time before TNNA. While I’m okay and on board with the idea of making the wrap fit so it gets the wearing and love it deserves, I have no idea where I am going to find the four hours of knitting time to redo what I’m about to rip out. Wish me luck.